Although the soil of the table-land is rich, and remarkably level for New Zealand, it can never be settled from the plain, because of the utter impracticability of its western face; the eastern slope is more gradual, but until a good harbour is found in the Bay of Plenty it will be of as little use as the other. On the western side there is no such well-defined boundary, but a number of round hills shut in the view. The volcanic ridge of Tongadido closes the view to the southward. I have never reached Tongadido from this route, but I have no doubt the ascent would be found very gradual to the base of the mountain. The Waiho is a river about the size of the Thames at Windsor. It runs with a steady, rapid current, and is generally free from logs and other obstructions; its average depth is about five feet, but it is too rapid to row against. The plain cannot properly be considered as the bed of the river, but a portion of original table-land through which it flows. The proper valley of the river is about half a mile wide, and is continuous with the course of the stream all through the plain. The land is rich, and is covered with flax from ten to twelve feet in height. Scattered at intervals are small groves of tall Kaikatea trees; but these spots are so few that the plain in general may be described as perfectly free from timber. also be a serious difficulty to the farmer, as he will, in most instances, be obliged to bring his wood for all purposes from a distance, besides buying, instead of cutting it upon his own land. The only advantage the Thames has over the Hutt is its plain, admirably adapted for rearing herds of cattle without the labour of cultivation, and I have no doubt, in a few years, it will be so occupied from New South Wales, by persons accustomed to that kind of employment; but I apprehend few from this place would at present feel disposed to embark in such a speculation. I can say, moreover, from all I have seen or heard of the different harbours of New Zealand, Port Nicholson is by far the best for the settlement of a new colony, not only from its geographical situation, but because the site of the town is much superior to any other that has yet been found in the country; and there is abundance of excellent land, sufficient for the employment of any amount of population there may be for twenty years to come. *Fully one half of the plain of the Waiho is an impassable bog covered with high rushes, the largest remaining portion poor fern land; and there is a considerable portion of wet stony land covered with rank vegetation without bushes. Gulf of Hamaki are more mountainous even than those of the Bay of Islands. At Port Nicholson there is an excellent harbour; a navigable river, the Hutt; a great extent of very rich land; an admirable site for the town; with a population at present of between two and three thousand persons, among whom are many of high family connexions and respectability from England, who have brought considerable capital with them, and a consequent demand for labour - most of which advantages are not to be found on the Thames, where there are as yet no emigrants, and where it is very certain none will be sent by Government, and where the population will be made up entirely from the emigration of doubtful characters from New South Wales, or of fickle, discontented spirits from this place. - The natives on the Thames have always been known as a very bad set, and those who were here at the beginning of this settlement will understand what trouble an ill-disposed set of natives may give to a new-comer, who has everything to do, and none but these to help him. New Zealand say of this place, as I am satisfied no long period will elapse before it will become, as it deserves, the one of the greatest consequence in the country; its local advantages being greater, and its settlers* so much superior in character, education, property, and every requisite for the final success of a colony to those of the resident Europeans in other parts of New Zealand, that it cannot fail to prosper, if the colonists do not suffer themselves to be deceived and misled into new schemes for further emigration by interested parties, and which they may be sure will do them no good, and only throw them back to the state of discomfort naturally incident to a first arrival in any new settlement. *I am at this moment residing with Mr. Molesworth, brother of Sir William Molesworth, Bart. ; and among a host of respectable settlers, who give a high moral tone to society here, I may name Petre, son of Lord Petre; - Sinclair, brother or son of Sir George Sinclair; Dorset, Wakefield, Hopper, Partridge, Bruce, Scot, Hobson, Mantell, Hunter, Majoribanks, Biggs, Jones, Lloyd, &c. &c.
Acland, Sir Thomas Dyke, Bart., M. P., Killerton, Devon. Atherly, Rev. Arthur, Heavitree, Devon, (sixteen copies). Allen, Rev. John, North Huish, Devon. Adams, Thomas B., Budleigh Salterton. Buller, James wentworth, Downes, Devon, (two copies). Buller, Captain Thomas Wentworth, R. N., Bryanston-square, London. Back, John, Kingsbury Lodge, St. Alban’s, (eight copies). Bell, F. Dillon, New Zealand House, London, (six copies). British Iron Company, London, (two copies). Boulderson, Captain, R. N., Penryn. Beer, Joseph R., St. Thomas, Exeter. Bear, John Penny, Chevestone, Kenton. Bear, Thomas Hutchings, Chevestone, Kenton. Bear, Miss E. A., Chevestone, Kenton. Bidwill, John Green, St. Thomas’, Exeter. Benison, W. M., St Thomas’, Exeter, (two copies). Bond, Rev. J., Stoke Canon, Devon. Barnes, Rev. Doctor George, Sowton, Devon, (two copies). Braund, George, St. Thomas’, Exeter. Barham, Thomas Foster, M. D., Exeter. Bowring, Richard, St. Thomas’, Exeter. Brodie, P. B., Lincoln’s-Inn-Fields, London. Butter, Jacobus S., Woodbury, Devon. Burne, Rev. Charles, Wear, Devon. Bush, G. T., North Parade, Bath, (two copies). Bourn, James, Bath, (two copies). Barker, J. T., Heavitree, Devon, (two copies). Biffen, Lieut. Edward, R. N., Liverpool. Buller, Sir Antony, Bart., Pound, Devon, (four copies). Blackall, Doctor, M. D., Exeter. Bulkeley, Captain, Mount Stone, Plymouth. Bucknall, H. and Sons, London. Courtenay, Right Honourable Lord, Powderham Castle, (four copies). Carwithen, Rev. Doctor William, Stoke Climsland, Devon. Cookeworthy, J. C., M. D., Plymouth. Cook, Richard, Bath, (two copies). Copleston, Rev. John G., Offwell, Devon. Collyns, Rev. Doctor Charles H., Farringdon, Devon. Clarke, James F., St. Thomas’, Exeter. Coldridge and Sons, Exeter, (three copies). Crane, William, Carlton Chambers, London. Cornick, Lieutenant, R. N., Kenton. Collins, Robert, St. Thomas’, Exeter. Carne, Charles Frederick, Liverpool, (ten copies). Cohen, Andrew, Colleton Place, Exeter. Chorley, William, jun., Quarm, Dulverton. Chambers, Doctor, M. D., London, (eight copies). Carne, William, Rosemundy, Cornwall, (four copies). Clossmann, F. F. and Co., London. Devon, the Right Honourable the Earl of, Powderham Castle, Devon, (six copies). Duckworth, Sir John Thomas, Bart., Wear, Devon. Davie, Sir Humphry P., Creedy, Devon. Divett, Edward, M. P., Bystock, Devon. Driver, Edward, Richmond Terrace, Whitehall. Dart, Joseph, Tidwell House, Devon. Dames, Rev. A. Longworth, Kenton, Devon. Drew, John, jun., Peamore, Devon. Dyer, Thomas, St. Thomas', Exeter. Davies, James and Son, London. Davies, Richard Longfield, Redinnick House, Penzance. Delacombe, Captain, R. M., Plymouth. Dawson, R. H., St. Thomas’, Exeter. Dillon and M’Donell, London, (fifty copies). Duppa, B. E., New Zealand House, London. Ellicombe, Rev. Richard, Alphington, Devon. Ellicombe, Rev. William Rouse, Clyst St. George, Devon. Eales, Richard, Eastdon House, Dawlish. Elliott, Doctor, M. D., Exeter. Evans, H. C., Bristol, (two copies). Eagle, Thomas, Bloxham, Banbury, (eight copies). Evans, H. S., Australian Emigration Office, London. Eddison, W. E., Walbrook, London. Edwards, H. and Son, Woodbridge. Follet, Sir William Webb, Knight, M. P., London. Forrest, Sir Diggory, Knight, Exmouth. Fulford, Colonel, Great Fulford, Devon. Friend, William, St. Thomas’, Exeter. Fouracre, Robert, St. Thomas', Exeter. Fisher, Thomas, Bath, (two copies). Francis, James, St. Thomas’, Exeter. Frodsham, Henry, Liverpool. Forbes, R., jun., London. Girdlestone, Samuel, Aston Terrace, Regent’s Park. Greenwood, Rev. Robert, Colleton Raleigh. Glendinning, Richard, St. Thomas’, Exeter. Gray, Miss, St. Thomas', Exeter. Gray, Miss M. A., St. Thomas’, Exeter. Gray, Thomas William, St. Thomas', Exeter. Gould, Thomas, St. Thomas’, Exeter. Greenway, James, Liverpool, (eight copies). Gray, Miss Ellen, Bordeaux, France. Gray, Miss Elizabeth, Archangel, Russia. Godsell, F. and E., London. Godard, P. and Co., Cognac, France. Garratt, John, Bishop’s Court, Devon. Gillon, John and Co., Leith. Hamilton, Alexander Hamilton, Retreat, Devon. Huyshe, Rev. John, Clysthydon, Devon. Huish, Rev. Jolm, Dix’s Fields, Exeter. Harrington, Rev. E. C., A. M., Exeter. Hartnol, Thomas, St. Thomas’, Exeter, (two copies). Hunter, T., Budleigh Salterton, Devon. Hartnoll, H. F., St. Thomas’, Devon. Huxham, Frederick, St. Thomas’, Exeter. Hatson, Campbell, Gordon Place, Tavistock Square, London. Hodge, James, St. Thomas’, Exeter. Hewet, Captain, R. V., St. Thomas', Exeter. Hill, Lieutenant John, R. N., Falmouth. Helston Reading Room and Library. Hex, Thomas, St. Thomas’, Exeter. Hogg, H. L., Clyst Honiton, Devon. Hart, Thomas, Stoke Cottage, Exeter. Houghton, G. and Sons, London. Hills, Son, and Underwood, London. Hepworth, W. and Co., London. Henekey, Kislingbury, and Co., London. Ireland, John, St. Thomas’, Exeter. Kennaway, Sir John, Bart., Escot, Devon. Kekewich, G. G., Summerlands, Exeter. Knowles, Stephen, Exeter, (two copies). Kersterman, H. G., Colleton Crescent, Exeter. Kinsman, Mrs., Falmouth, (two copies). Lowe, Rev. Thomas Hill, the Dean of Exeter. Lucas, Doctor, R. H., M. D., Exeter. Lindley, Doctor, Regent Street, Loudon. Lindon, J., Plymouth, (two copies). Lyddon, James, St. Thomas’, Exeter. Lewis, Captain F. L., R. E., Exeter. Langdon, Mrs., Cross Mead, St. Thomas’. Langdon, Mrs. John, Cross Mead, St. Thomas’. Langdon, Mrs. William, Cross Mead, St. Thomas’. Langdon, Miss, Cross Mead, St. Thomas’. Land, Thomas, St. Thomas’, Exeter. Ley, Rev. Jacob, Ashprington, Devon, (two copies). Mills, Rev. W., D. D., Exeter. Marsh, James, Alphington Villa, Devon. Mackintosh, John, Exeter, (four copies). Medley, Rev. John, St. Thomas’, Exeter. Mathews, Charles, St. Thomas’, Exeter. Mansford, T., Beaufort Buildings, Bath, (two copies). Mortimer, Samuel, Fort Barbican, Exeter. Mudge, John, Brampford Speke, Devon. Matthews, Henry, Exeter, (four copies). Manning, J., New Bank Buildings, London. Moxhay, R. H., Heavitree, Devon. Mackintosh and Co., Cheapside, London, (four copies). Maingy, Captain Peter, R. N., Stonehouse. Marzetti, J. G., London, (fifty copies). Muir, John and Sons, Edinburgh. Nunn, J., Charles Street, Bath, (two copies). Owen, Thomas, jun., St. Thomas’, Devon. Parker, Montague, E. N., M. P., Whiteway, Devon. Pitman, Rev. John, Broadhempston, Devon. Pyle, Rev. Samuel, Topsham, (three copies). Ponsford, Luke, St. Thomas’, Devon. Pym, Miss, St. Thomas’, Exeter. Pigou and Wilks, London, (two copies). Packer, John, Aqueduct, Bath, (two copies). Pince, R. T., Nurseryman, Devon. Poppin, Rev. S. H., Branscombe, Devon. Rolle, Right Honourable Lord, Bicton, Devon, (four copies). Rolle, Right Honourable Lady, Bicton, Devon, (four copies). Rabone, Edward, Birmingham, (eight copies). Rathbone, William, Greenbank, Liverpool, (four copies). Rathbone, Richard, Woodcroft, Liverpool, (four copies). Ross, F. W. L., Broadway-house, Topsham. Radford, W. T. A., do. do. Roberts, C. R., Fort-hill, Barum. Royal Bank of Australia, London. Stevens, Rev. Archdeacon John Moore, Otterton, Devon. Strangways, Rev. H., Rowe, Devon. Sillifant, John, jun., Coombe, Crediton. Smythe, Capt. R. E., Pennsylvania, Exeter. Snow, Thomas, Franklyn, St. Thomas. Short, Capt. W. P., Heavitree, Devon. Scot, Charles Davison, Euston Place, Euston Square, London. Scot, Miss, do. do. do. Salter, Rev. W., Mount Radford, Exeter. Salter, Thomas U., Heavitree, Devon. Salter, Benjamin, Mount Radford, Devon. Smith, Abraham, Jun., Honiton Clyst., Devon. Savory, Richard, Bovey Tracey, Devon. Symes, William, Tavistock Square, London. Scadding, Edwin, Gordon Street, London. Seanes, John, St. Thomas’, Exeter. Shirreff, C., Beacon House, Devon. Snook, J. S., Colyton, Devon. Thomas, Lieut. General, Strete Raleigh, Devon. Tyrrell, John, St. Leonard’s, Devon, (four copies). Terrell, James, Exeter, (six copies). Tregellis, Edwin O., Cottage, Falmouth, (six copies). Turner, William, Walcot Buildings, Bath, (two copies). Tanner, W. H., Exeter, (two copies). Templeton, James, A. M., Exeter. Tucker, Rev. H. T., Upottery. Townend, William, Bread Street, London. Thomas, J. L., St. Thomas’, Exeter. Toll, Capt. H. T., Perridge, Devon. Tripp, Rev. R. H., St. Sidwell’s, Exeter. 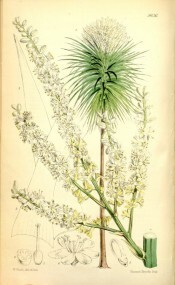 Veitch, James, and Son, Nurserymen, Exeter, (four copies). Vyse, Thomas, Cripplegate Buildings, London. Vigurs, Richard, M. B., Falmouth. Williams, Capt., R. N., Sowdon Lympstone. Wade, Colonel, Poor Law Commissioner, Devon, (four copies). Walkey, Rev. Charles E., Clyst St. Lawrence, Devon. Wilkinson, W. J. P., Exeter. Wilcocks, J. P., Plymouth, (two copies). Wilcocks, J. M., Spurbarne, Devon, (two copies). White, Edward, St. Thomas’, Exeter. Ward, Joel H., do. do. Wescot, Miss, Mount Radford, Exeter. Woolcombe, Mrs. Capt. Edward, R. N., Exeter. Westmot, J. L., St. John’s, New Brunswick. Walker, D. R. G., Budleigh Salterton, Devon. Woodley, W. and J., London. Wood, M. and Co., London. London: Bradbury and Evans, Printers, Whitefriars. Cordyline australis Hook.f. | BM t.5636/1867 | BHL. This beautiful New Zealand Cordyline is described in the text of Rambles.